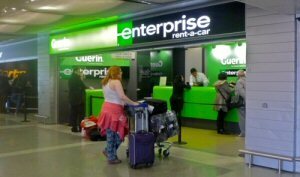 According to a report via Breaking Travel News, Enterprise Rent-A-Car branches are now open at major airport and city locations in Poland, Turkey, Israel and Switzerland. As the rental car in Europe space heats up, partnerships with key players now receives its just due. In an ever expanding partnership with rental car businesses worldwide, one of the world’s biggest rental companies now develops an integrated international car hire network. In correlaty news earlier this month Hertz announced offers for passengers of Ryanair access to a wide range of vehicles at all 185 Ryanair airports in Europe and North Africa. So this Enterprise news draws tighter focus as strategy versus simple customer value propositioning. Already operational in over 23 countries in Europe and the Middle East, the news from Enterprise says they’re ready to add more partners in the coming months. Travelers across Europe can expect to see Enterprise-branded branches as more and more business and leisure travelers choose to rent when they travel. In Europe, Enterprise Rent-A-Car operates in Austria, Belgium, Bosnia Herzegovina, Bulgaria, Croatia, Cyprus, the Czech Republic, France, Germany, Greece, Hungary, Ireland, Italy, Macedonia, the Netherlands, Portugal, Slovakia, Spain and the UK, in addition to the newly announced destinations. Back in June Enterprise also announced having expanded operations to include Iceland by appointing Reykjavik Excursions as a franchise partner in there. This, taken with the Sixt Car Rentals summer revenue gain of 8.5% to EUR 760.2 million compared to the same period last year, shows the rental game on the old continent as one of the most hotly contested business sectors anywhere. For the consumer, expect more and more added value and deals headed your way. As any traveler knows, touring by car is the best way to see Europe. Looking for Budget Car Rental for your holidays in Europe? Check http://www.travelholidaycars.com for fair prices on quality car hire.